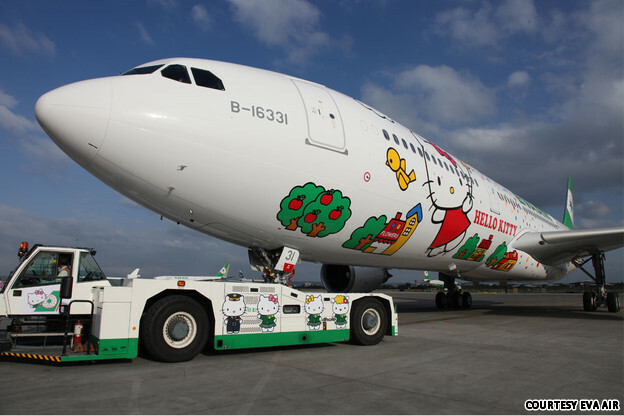 EVA Air spreads the message of love and friendship with Magic Jet, brings the world together with Global Jet and celebrates Hello Kitty’s love of apples with Apple Jet. No matter how cute her smile, it can’t compete with her apron. The world’s cutest boarding passes and baggage stickers. 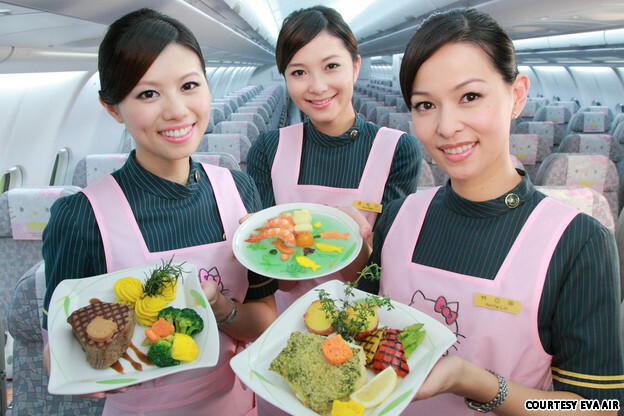 The carrier has recently launched three Hello Kitty-themed aircraft [Chinese language], on which everything from the fuselage to the flight attendants to the food is kitted out in the kawaii cat brand’s images. "Many people specify that they want to take EVA’s special Hello Kitty jet," said Wong. "The response has been excellent so far." 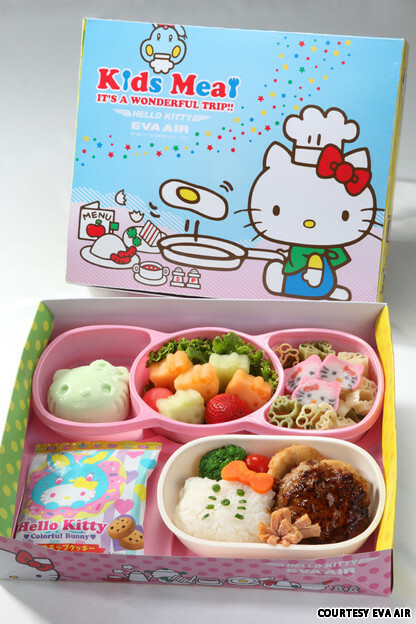 This isn’t the first time Taiwan’s second-largest carrier and Japan’s comic company, Sanrio, which owns the Hello Kitty brand, have collaborated. The new Taipei-based Hello Kitty jets — called Apple Jet, Global Jet and Magic Jet — will operate for at least a year on different routes originating from Taipei. Magic Jet flies to Sapporo and Guam. Apple Jet flies to Seoul and Fukuoka. Global Jet serves Hong Kong and Tokyo. 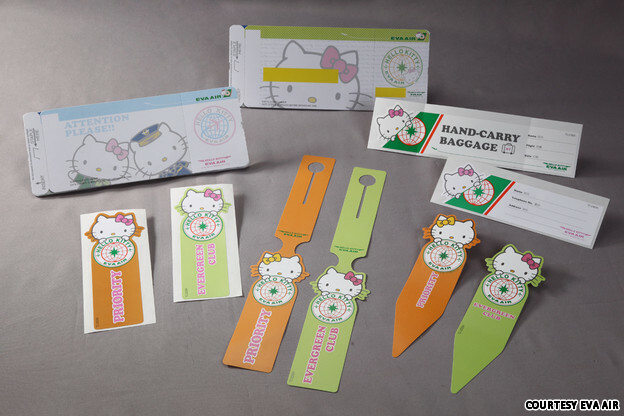 The Hello Kitty journey starts with Hello Kitty boarding passes and baggage stickers. Then passengers make their way to a you-can’t-miss-it gate dedicated to the Hello Kitty flyer. The boarding gate in Taipei’s Taoyuan International Airport is pink and features a Hello Kitty playground. 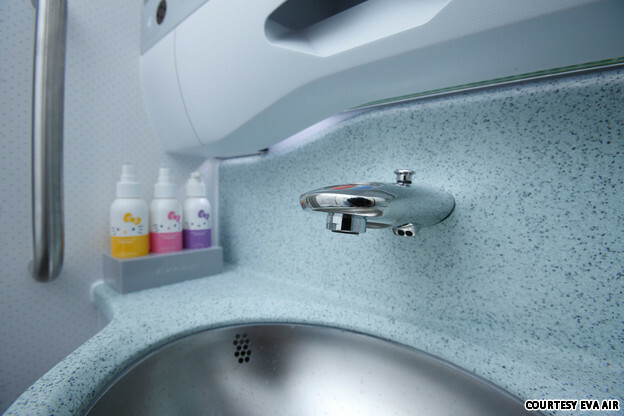 On board, more than 100 in-flight items are specially designed with the Hello Kitty motif — including headrest covers, tissues, paper cups, utensils, milk bottles, snacks, soap dispensers, hand lotion, meals and ice cream. A dedicated website (in Chinese, Korean and Japanese only) features Kitty White — Hello Kitty’s "real" name — from which we learn that Hello Kitty weighs as much as three apples and is as tall as five apples. 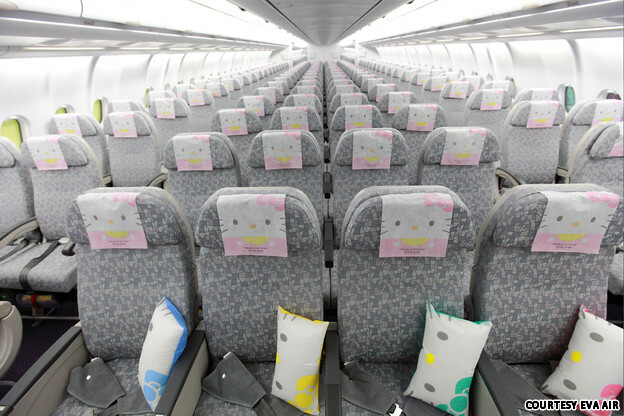 The Hello Kitty theme can be found on the carrier’s new Airbus A330-300s. Each of the new aircraft provides 30 premium laurel class seats (EVA’s business class) and 279 economy class seats. Magic Jet flies Taipei-Sapporo (BR116/115) daily and Taipei-Guam (BR20/19) on Tuesdays and Saturdays. Apple Jet flies Taipei-Fukuoka (BR2106/2105) every Tuesday, Wednesday, Saturday and Sunday; Taipei-Seoul (BR160/159) daily. Global Jet flies Taipei-Hong Kong (BR857/858) and Taipei-Tokyo (BR2189/2197) daily.